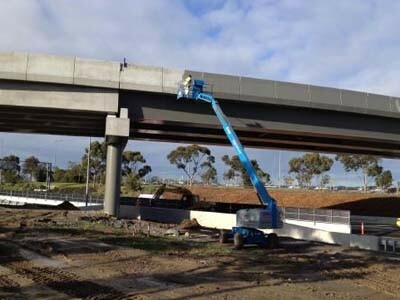 An anti-carbonation coating from Nanokote was specified for a new flyover bridge built to assist the flow of traffic in and out of Melbourne Airport. McConnell Dowell was contracted by Asia Pacific Airports Corporation (APAC) to paint the entire bridge using a Vic Roads approved decorative, anti carbonation coating in order to protect the concrete from degradation. The scope of painting work on the bridge at APAC Drive covered an area of 7,000 square metres and included the bridge piers, parapets, beams, abutments and crossheads. During the discussion stage prior to Nanokote entering the picture, it was decided to delay the project completion from August 2012 until November 2012. This delay was attributed to the cold, wet winter that would normally impede the painting process since most paint systems require temperatures above 10°C and a relative humidity below 85%. Nanokote recommended ProGuard coating for the painting project on the bridge. ProGuard can be applied directly to damp or dry concrete at temperatures down to 2°C and relative humidity above 95%. Thanks to Nanokote’s ProGuard, McConnell Dowell was able to complete their project on time in August 2012 despite very challenging weather conditions where ambient temperatures were 2 - 8°C with a lot of rain. A division of Australian nanomaterials company Micronisers Pty Ltd, Nanokote specialises in providing finished coating materials such as specialised thin films, barrier coatings and functional coatings.